Gradle is a great tool for setting up and building your Java projects. If you want to deliver them for Ubuntu or other debian-based distributions you should consider building .deb packages. Because of the quite steep learning curve of debian packaging I want to show you a step-by-step guide to get you up to speed. You have a project that can be built by gradle using gradle wrapper. In addition you have a debian-based system where you can install and use the packaging utilities used to create the package metadata and the final packages. Choose “indep binary” (“i”) as type of package because Java is architecture indendepent. This will generate the debian directory containing all the files for creating .deb packages. You can safely ignore all of the files ending with .ex as they are examples features like manpage-generation, additional scripts pre- and post-installation and many other aspects. If you have other dependencies that can be resolved by packages of the distribution add them there, too. The most important file is the rules makefile which defines how our project is built and what the resulting package contents consist of. For this to work with gradle we use the javahelper dh_make extension and override some targets to tune the results. Key in all this is that the directory debian/$project_name/ contains a directory structure with all our files we want to install on the target machine. In our example we will put everything into the directory /opt/my_project. The rules file is in GNU make syntax and executes each command separately. So you have to make sure everything is on “one line” if you want to access environment variables for example. This is achieved by \ as continuation character. You have to escape the $ to use shell variables. Debian packaging can be daunting at first but using and understanding the tools you can build new packages of your projects in a few minutes. I hope this guide helps you to find a starting point for your gradle-based projects. If you’re traveling to China you have to be prepared that a lot of sites you are using daily might be blocked due to the Great Firewall. Recently I was there on a business trip as a software developer and here are my notes on what works and what doesn’t, including some tips. recognized that I was using English search queries and offered to switch the user interface to English. WhatsApp, Facebook, Instagram and Twitter are not available. Since I don’t use them anyway I didn’t miss them. Some news sites occasionally embed Instagram pictures and Twitter posts in their articles, for example announcements by the US president or similar. You won’t see those either. There are sites where you can check in advance if your favorite websites are accessible. There’s also an overview with the status of high-ranking websites on Wikipedia. Apparently using a VPN is not illegal, but access to a lot of VPN services is blocked. If you want to use a VPN app you should download it before entering the country. I personally didn’t feel the need to use a VPN. Recently I was in a pair programming session, when I noticed that there were three cursors blinking in the editor window of the IDE. I initially assumed it was a bug in the IDE (which is not that uncommon), but it acutally turned out it was a feature. In IntelliJ based IDEs you can place multiple cursors in the editor window, start typing and the typed text gets inserted at all of these positions. To achieve this press Shift+Alt while clicking the mouse to position the cursor carets. When I start using a new IDE I usually look up and memorize the shortcuts for refactoring operations like “rename” or “extract method” or other essential operations like “quick fix”. But of course there are many other neat tricks for advanced text editing in most IDEs and programming editors. Here are some of them, in this case for IntelliJ based IDEs. This one comes in handy when you have to select a column of text, for example a common prefix of keys in a properties file. I initially knew this type of selection from Vim, but many other programming editors allow it too. For a rectangular selection in IntelliJ based IDEs press Ctrl+Shift+Alt (Shift+Alt+Cmd on Mac) and drag the mouse pointer. Similar to the multiple cursors feature mentioned at the beginning of this post, you can also select multiple parts of a text at once and then cut, copy or delete them. To achieve this multi-selection press Shift+Alt while selecting text. By pressing Ctrl+W repeatedly within a fragment of code the selection will progressively extend. First the current expression under the cursor is selected, then the surrounding code block, then the code block surrounding this code block, etc. Take some time and look up some of the more advanced text editing capabilities of your IDE or text editor. Adopt them if you find them helpful and share them with your colleagues, for example in a pair programming session. Deployment of software using built-in software management tools is very convenient and provides a nice user experience (UX) for the users. For debian-based linux distributions like Ubuntu packaging software in .deb-packages is the way to go. So how can we prepare our python projects for packaging as a deb-package? The good news is that python is supported out-of-the-box in the debian package build system. Alternatively, you can use the distutils-extension stdeb if you do not need complete flexibility in creating the packages. After that you can build the package issueing dpkg-buildpackage. The debian packaging system is great in complaining about non-conformant aspects of your package. It demands digital signatures, correct file and directory names including version strings etc. Unfortunately it is not very helpful when you make packaging mistakes resulting in empty, incomplete or broken packages. The setup.py build script has to reside on the same level as the debian-directory containing the package metadata. The packaging tools will not tell you if they could not find the setup script. In addition it will always run setup.py using python 2, even if you specified --with python3 in the rules-file. Without the dh-python build dependency pybuild will silently do nothing. Getting the build dependencies wrong will create incomplete or broken packages. Take extra care of getting this right! Debian packaging looks quite intimidating at first because there are so many ways to build a package. Many different tools can ease package creation but also add confusion. Packaging python software is done easily if you know the quirks. The python examples from the Guide for Debian Maintainers are certainly worth a look! Naming things is supposedly one of the two hard things in Computer Science. Here are some tips on naming for programmers. Of course, you can do this only if you don’t use a framework that depends on the convention to recognize properties via reflection (like some OR mappers, for example). What about setters? I rarely write setters anymore. If you design your classes as immutable types you don’t need setters. Even if your class has mutable state you probably want to control this state via methods more specific to the domain of the problem. Also, the more you apply the tell, don’t ask principle the less you will find the need for getters. Fortunately, times have changed for the better, and most programmers are aware that descriptive naming is important. However, some programmers do over-compensate. Length of an identifier is not a virtue by itself. This is a reasonably sufficient name for such a common functionality in programming. Here’s another example: If the concept of a measurement station is very prevalent in the domain of your project then it’s ok to call instances just station instead of measurementStation if it’s the only kind of station in the domain. The famous Hungarian notation is no longer in widespread use. However, there are variations of it that I would recommend against as well for the sake of readability. For example, bookList or bookArray can be simply books. Another variation would be conventions like myField or m_field for member variables. If you need these notations to determine the origin of a variable, then your scopes are probably too big, i.e. your methods, functions or classes are too long. Additionally, IDEs and editors for programmers can highlight these different scopes anyway. Other examples for unnecessary Hungarian-style notation are IFoo for interfaces, EFoo for enums or the infamous FooImpl. There is really no need for constants and enum values to constantly SCREAM at you and other readers. This SCREAMING_CASE convention has its origin in C, where constants used to be defined as macros when the const keyword wasn’t introduced yet, and it later found its way into other programming language ecosystems. Names for constants and enum values are not more important than other identifiers and don’t have to be spelled differently. Try it, you will enjoy the newfound silence in your code. These are some tips to improve readability of code through better names. Some of these tips go against traditional conventions, so you should discuss them with your team before applying them. Consistency within an existing code base can definitely be more important. But if you have the freedom you should definitely give them a try. Well okay, actually I’m still using them, but I thought the absolute would make for a better headline. But I do not use them nearly as much as I used to. Almost exactly a year ago, I even described them as an integral part of my unit design. Nowadays, most units I write do not have an unnamed namespace at all. What’s so great about unnamed namespaces? Back when I still used them, my code would usually evolve gradually through a few different “stages of visibility”. The first of these stages was the unnamed-namespace. Later stages would either be a free-function or a private/public member-function. Lets say I identify a bit of code that I could reuse. I refactor it into a separate function. Since that bit of code is only used in that compile unit, it makes sense to put this function into an unnamed namespace that is only visible in the implementation of that unit. Okay great, now we have reusability within this one compile unit, and we didn’t even have to recompile any of the units clients. Also, we can just “Hack away” on this code. It’s very local and exists solely to provide for our implementation needs. We can cobble it together without worrying that anyone else might ever have to use it. This all feels pretty great at first. You are writing smaller functions and classes after all. Whole class hierarchies are defined this way. Invisible to all but yourself. Protected and sheltered from the ugly world of external clients. What’s so bad about unnamed namespaces? 1. The code is never needed again outside of the unit. Forgotten by all but the compiler, it exists happily in its seclusion. 2. The code is needed elsewhere. 1. People forgot about it, and solve the problem again. 2. People never learned about it, and solve the problem again. 3. People know about it, and copy-and-paste the code to solve their problem. 4. People know about it and make the function more widely available to call it directly. Except for the last, that’s a pretty grim outlook. The first two cases are usually the result of the bad discoverability. If you haven’t worked with that code extensively, it is pretty certain that you do not even know that is exists. The third is often a consequence of the fact that this function was not initially written for reuse. This can mean that it cannot be called from the outside because it cannot be accessed. But often, there’s some small dependency to the exact place where it’s defined. People came to this function because they want to solve another problem, not to figure out how to make this function visible to them. Call it lazyness or pragmatism, but they now have a case for just copying it. It happens and shouldn’t be incentivised. A Bug? In my code? Now imagine you don’t care much about such noble long term code quality concerns as code duplication. After all, deduplication just increases coupling, right? But you do care about satisfied customers, possibly because your job depends on it. One of your customers provides you with a crash dump and the stacktrace clearly points to your hidden and protected function. Since you’re a good developer, you decide to reproduce the crash in a unit test. Only that does not work. The function is not accessible to your test. You first need to refactor the code to actually make it testable. That’s a terrible situation to be in. There’s really only two choices. 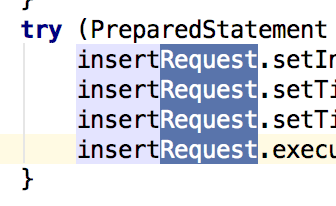 Either make it a public function of your unit immediatly, or move it to another unit. For functional units, its usually not a problem to just make them public. At least as long as the function does not access any global data. For class units, there is a decision to make, but it is simple. Will using preserve all class invariants? If so, you can move it or make it a public function. But if not, you absolutely should move it to another unit. Often, this actually helps with deciding for what to create a new class! Note that private and protected functions suffer many of the same drawbacks as functions in unnamed-namespaces. Sometimes, either of these options is a valid shortcut. But if you can, please, avoid them. Last week, I had the chance to try out coroutines as a way to cooperatively interleave long tasks with event-processing. Unlike threads, where you can have interaction between between threads at any time, coroutines need to yield control explicitly, whic arguably makes synchronisation a little simpler. Especially in (legacy) systems that are not designed for concurrency. Of course, since coroutines do not run at the same time, you do not get the perks from concurrency either. If you don’t know coroutines, think of them as functions that can be paused and resumed. Unlike many other languages, C++ does not have built-in support for coroutines just yet. There are, however, several alternatives. On Windows, you can use the Fiber API to implement coroutines easily. Typically, creation of a Coroutine type allocates all the resources it needs, while setup “primes” it with an inner “Run” function that can use an implementation-specific “Yield” function to pass control back to the caller, which is whoever calls step. The idea here is that the caller and the callee are both fibers: lightweight threads without concurrency. Running the coroutine switches to the callee’s, the run function’s, fiber. Yielding switches back to the caller. Note that it is currently assumed that all callers are from the same thread, since each thread that participates in the switching needs to be converted to a fiber initially, even the caller. The current version only keeps the fiber for the initial thread in a single static variable. However, it should be possible to support this by replacing the single static fiber pointer with a map that maps each thread to its associated fiber. Note that you cannot return from the fiberproc – that will just terminate the whole thread! Instead, just yield back to the caller and either re-use or destroy the fiber. Fiber-based coroutines are a nice and efficient way to model non-linear control-flow explicitly, but they do not come without downsides. For example, while this example worked flawlessly when compiled with visual studio, Cygwin just terminates without even an error. If you’re used to working with the visual studio debugger, it may surprise you that the caller gets hidden completely while you’re in the run function. The run functions stack completely replaces the callers stack until you call yield(). This means that you cannot find out who called step(). On the other hand, if you’re actually doing a lot of processing in the run function, this is quite nice for profiling, as the “processing” call tree seemingly has its own root in the call-tree. I just wish the visual studio debugger had a way to view the states of the different fibers like it has for threads. On Linux, you can use the ucontext. Visual Studio 2015 also has another, newer, implementation. Coroutines can be implemented using threads and condition-variables. There’s also Boost.Coroutine, if you need an independent implementation of the concept. From what I gather, they only use Fibers optionally, and otherwise do the required “trickery” themselves. Maybe this even keeps the caller-stack visible – it is certainly worth exploring.